Gencoa (specialists in thin film technology) have moved to fabulous new premises in Speke, Liverpool. The modern interior has acres of clean white walls crying out for some workplace art from Painted4me. The company employs over 30 people with three quarters working in roles dedicated to product design, development or assembly in the large workshop area, which is overlooked by spacious open-plan offices on both floors. Here is just a taste of the work in progress. New products and processes recorded by an in-house photographer were identified as ideal material to use creatively and 16 were selected for large acrylic panels in the reception, stairs and boardroom. A wallpaper feature wall has been designed for the boardroom showing Liverpool scenes, particularly as they entertain overseas clients who like to get a flavour of the city. Another creative design is in progress for the large stairs wall, working with our Lancashire Life artist, Nick Oliver. The remaining office areas will feature more creative product images as well as the work of several more of our artists as special commissions. 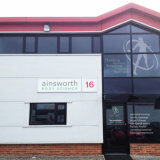 Ainsworth Body Science, a personal training and fitness studio, with the emphasis on nutrition and lifestyle choices, came to Primary Graphics for branding as well as help in deciding on a name for their business. Primary provided the name and brand image (with website and literature) and a scheme for the exterior and interior of the business HQ. 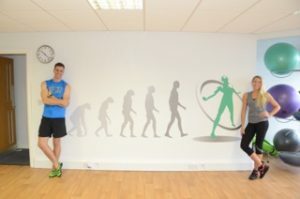 This included a feature wall with imagery of the evolution of man, incorporating the logo figure. Greater Manchester West Mental Health NHS Foundation Trust (GMW) is bringing patients and organisational staff together under one roof in The Curve, a new mental health ‘Recovery Academy’ on the site of Prestwich Hospital. 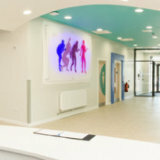 Named by service users, the new building embodies the learning ‘curve’ taking place in society with regards to mental health awareness and the recovery journey patients embark on.The interior design includes contemporary artworks created by our award-winning artist, Gerry Halpin MBE (President of Manchester Academy of Fine Arts) in conjunction with patients. 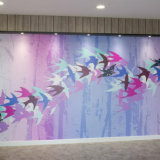 Part of the brief was to create a feature wall with British birds. Gerry’s design showed swallows flying in a curve. Another illuminated panel in coloured acrylic showed a series of figures representing Gerry’s interpretation of ‘Recovery’.